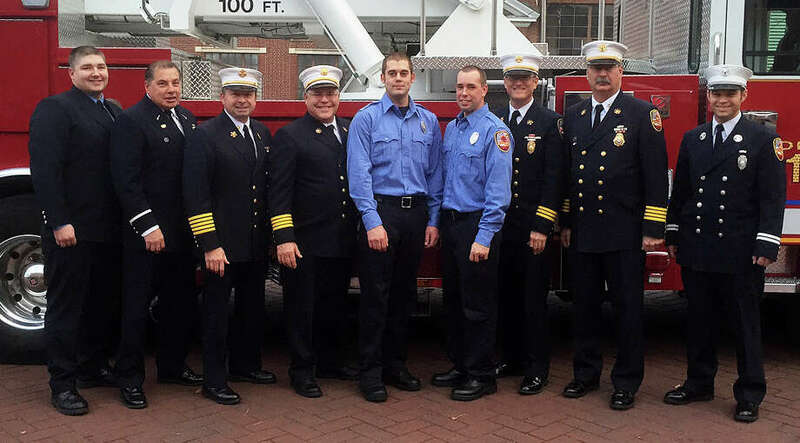 Probationary Firefighters Adam Gamble and Ronald Burgess are flanked by Fire Department officials following their recent from the Connecticut Fire Academyís recruit-training program. Two probationary firefighters from the Westport Fire Department were among the recent graduates of the Connecticut Fire Academy’s recruit program. Ronald Burgess and Adam Gamble were among the 51 graduates of the 14-week program, which officials said focuses on developing the knowledge, skills and abilities of a newly hired firefighter. Also, according to officials, there is an emphasis on teamwork, company morale, self-discipline, conduct and physical fitness. The Dec. 11 graduation ceremony took place on the campus of Central Connecticut State University in New Britain. Among those on hand to congratulate the local firefighters were Fire Chief Andrew Kingsbury, Deputy Chief Robert Kepchar and several members of the Westport department.